Another delightful print from Lisa McCue. Quiet Bunny and The Night Song will add some extra sweetness to a beautiful baby quilt. A rich blue back ground with playful brown bear cubs, brown squirrels, foxes and of course we can't forget the green turtles and frogs. 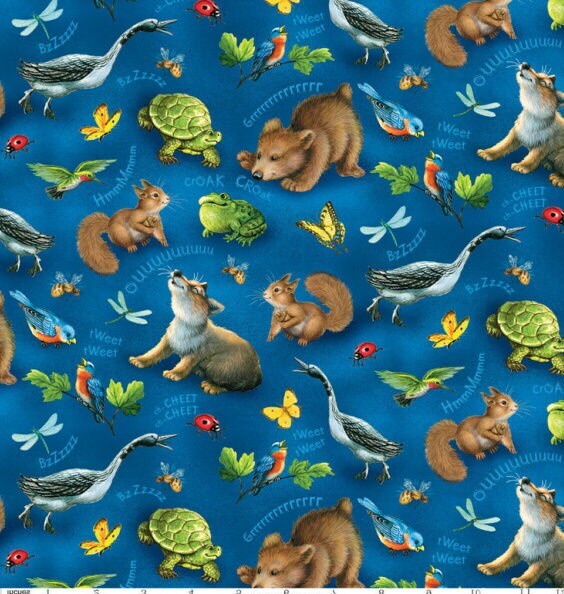 You will also find beautiful butterflies, lady bugs and colorful birds flying across the fabric. This is a must have for any baby nursery and children's quilt. Fast shipping. Purchased with ease. Just what I needed to finish my project. Great seller! Fabric is high quality and adorable! Thank you!